I watch the housing market statistics closely every month, and share those for Carlsbad here, but for 10 communities I service on my other blog at ActiveRain. Watching local market statistics each month is an important part of being informed as a Realtor, as is being active with buyers and sellers who are making buying and selling decisions, plus talking to agents, and others in the real estate profession, about what they are seeing. Our housing market, in general, has been favoring sellers essentially since spring 2012, i.e., based on supply and demand (rate of sales) there has been less inventory than needed to meet buyer demand, which has resulted in rising prices, multiple competing offers, and many homes selling at or above asking price. 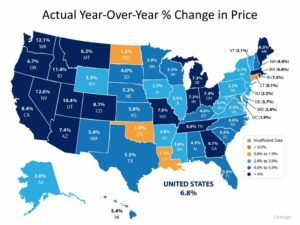 Nationally, prices have risen 6.8% year-over-year, and here in California they have increased 8.4% from 1 year ago. The shift in prices varies by local community and other factors. It’s been good for sellers in terms of additional equity, but it’s been a challenging time for many buyers. One change I’ve seen this year from 1 year ago in the North County San Diego area is an increase in inventory, in some cases fairly significantly, ranging from 7% to over 100% depending on community and type of house (detached single family versus attached [condos, town homes]) which has been good news for buyers, in general. However, demand has remained strong and despite these increases many communities still have housing markets that favor sellers. In Carlsbad, for example, we currently have about 2.3 months of inventory for single family homes; it’s 1.9 months in Oceanside, 2.5 months in Encinitas and Escondido, and 1.9 months in San Marcos. Some markets, however – La Jolla, Rancho Santa Fe, Del Mar – have become more normal or “balanced” markets (i.e., 6 to 7 months of inventory), at least for single family detached homes, indicating a shift in the higher end and luxury housing market sector. We are seeing more homes going pending with offers that are contingent on the buyers selling their homes, with a first right of refusal. These are not common, but we almost never saw contingent offers getting accepted in the recent past because of multiple competing offers where there were no buyer contingencies on selling a home. Now, in some cases, the only offer is a contingent one and some sellers are willing to take a chance and accept these offers. We are still seeing a good number of homes selling at or above asking price, although the percentage varies each month, and by community and price range. For example, 27% of the sales in August 2018 in Carlsbad were at or above asking price; it was 36% in San Marcos, 30% in Del Mar, 31% in Oceanside, 26% in Encinitas, 33% in Vista, and 28% in Fallbrook. Some other communities are higher, others are lower. There are more price reductions taking place these days than in the past, although the number is still fairly small. Some sellers have been overly ambitious in their pricing starting out, and with more inventory buyers have more options that in the past. Some homes, especially more expensive properties, are sitting on the market longer than before. While the average marketing time, however, is still around 1 month in many areas, some homes are taking 2 and 3 months to sell, or longer, and there is more competition than in the past. The MLS does not report the number of offers received on any given house, but in speaking with a number of agents it seems that while multiple offers are still happening, it is not as widespread as it was in the past, and for less expensive homes. I have also noticed more open house signs on the weekends. Some of that, no doubt, is due to summer being over, and the kids being back in school. Plus, traditionally, the fall is a fairly busy housing market and buyers are out looking. But I think it is also a reflection of the longer marketing time for homes that are not selling within days of hitting the MLS, and buyers are taking longer to make decisions given the increased inventory, and some are feeling less pressure to buy quickly. The statistics suggest we are moving toward a more normal market, with the increasing inventory being just one aspect of that shift. 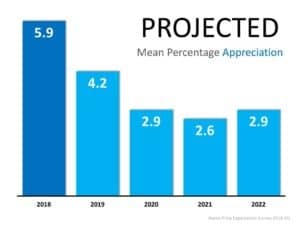 While prices are still rising, the level of appreciation is projected to become more normal over the next few years, which is not a bad thing as compared to the rapid rise we have seen in recent years. Prices are not projected to drop but to continue to increase, but at more normal levels. If you would like more details about your local housing market or have any questions, please reach out to me at (760) 840-1360. I’m happy to talk with you about your housing needs and budget and help you buy a new home in Carlsbad or elsewhere in North San Diego County. If you are interested in selling home, let’s talk about the market value and what I will do to assist you in getting the best price for your home.